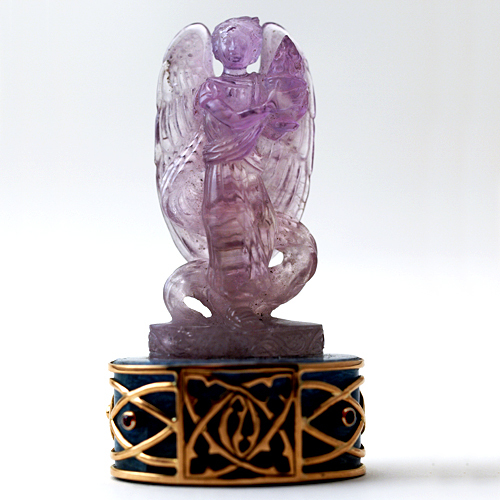 Dimensions (HxWxD): 2.7" x 1.45" x 1.1"
This gorgeous museum quality 139.5 carat Amethyst, Aquamarine and Red Tourmaline Sculptured Gemstone Altar of Archangel Zadkiel is 1.6" high. 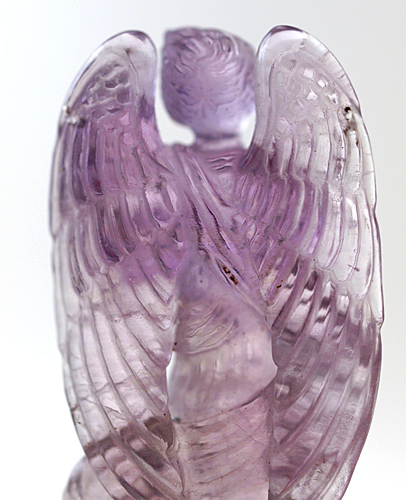 The figurine of Archangel Zadkiel, Custodian of the Holy Grail, is 89 carats in weight and and was carved from a single large Amethyst gemstone with loving care by Pedro, a world-renowned artist, jeweler and shamanic practitioner, who resides in Tokyo, Japan. 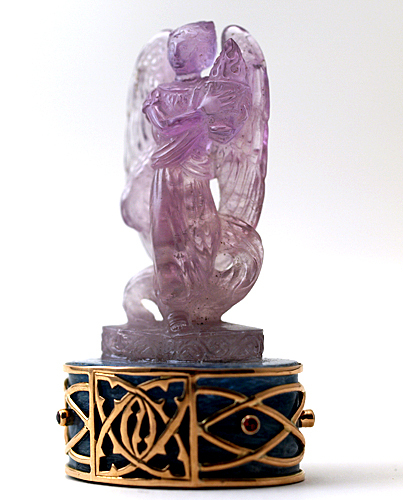 Pedro set this stunning Zadkiel figurine on a massive Aquamarine gemstone base wrapped in 22 karat gold latticework, with a matching set of six radiant red tourmaline gemstones set into the base. 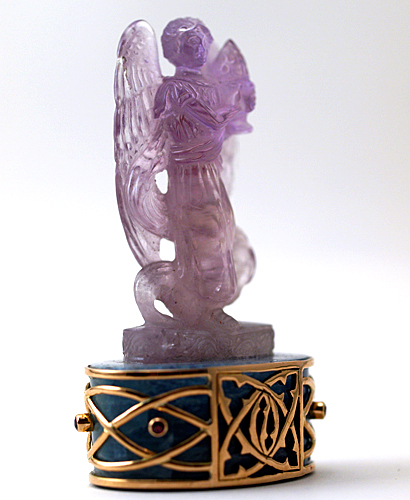 This remarkable Angelic altar is both a Lightworker's power tool and a true collector's item. Zadkiel is the Archangel of Prayer and Surrender, the Angelic Custodian of the Holy Grail and the Violet Ray and the Wielder of the Violet Flame of Transformation, Purification and Immortality. In Mystical Christianity and modern Western mystery school traditions, Zadkiel is considered to be the Archangel who appeared to Sir Galahad when he had finally surrendered in his quest to find the Holy Grail. 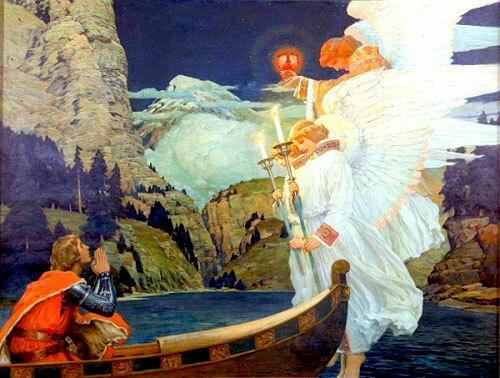 As Galahad meditated, deep in prayer, feeling his quest had been in vain, and offering up his own will to the Divine in the Spirit of the Crucified Christ who said, “Not my will but Thine be done,” Zadkiel and two attendant angels appeared to the prostrate Knight, bearing the Sacred Grail Cup. Zadkiel is the Archangel of Alchemical Transformation, He who answers the prayers of those who have surrendered their Will to the Divine, raising the vibrations of the Lower Mind and the egotistical personality to the higher frequencies characteristic of the Higher Mind and the Higher Self. Thus Zadkiel is considered by Western mystics to be the Angelic Custodian of the Violet Flame of Alchemical Tranformation, the instrument of the purification of the Human Mind, Body and Soul, and thus the pathway to Immortality. Surrender to a Love Divine, forgiveness for ourselves and others, these are the keys to Higher Realms. Surrender, love, and forgiveness bring us understanding, and elevation of the mind beyond the personality to the trans-personal realms of the Higher Self, where fear, anger, hatred, anxiety, resentment, guilt and sin are banished by the transforming power of the Violet Flame. The Violet Flame is the Spiritual Instrument elevating humanity to the realms of Divine Truth and Unity. The Ascended Master who is Master of the Seventh Ray is Count St. Germain, the eighteenth century reincarnation of the Western Mystic and Adept Christian Rosenkreuz, apochryphal founder of the Rosicrucian Order. St. Germain and Zadkiel work closely together, and the workings of the Seventh Ray focus greatly on the use of ceremonial magic and alchemy to purify and transmute the lower, animal instincts of humanity into higher impulses, higher thought-forms, more evolved emotional states, and more purified energetic signatures at all levels of being. 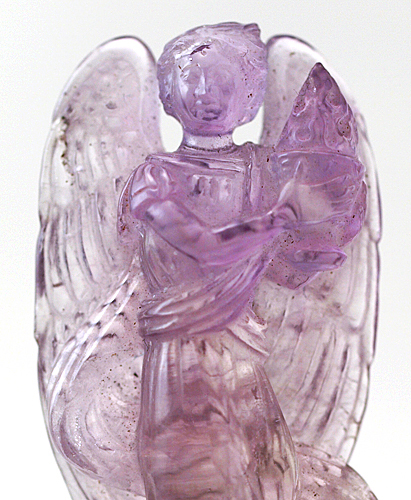 Many of these modern acolytes of the Great Alchemist utilize crystals and gemstones thought to resonate with the energy vibration of the Violet Ray, under the guidance of Master St. Germain and Archangel Zadkiel for purification and to raise the kundalini energy in a quest for Unity Consciousness. Such crystals and gems include especially amethyst, that violet colored form of quartz once so favored by the Pope and Bishops of the Catholic Church. 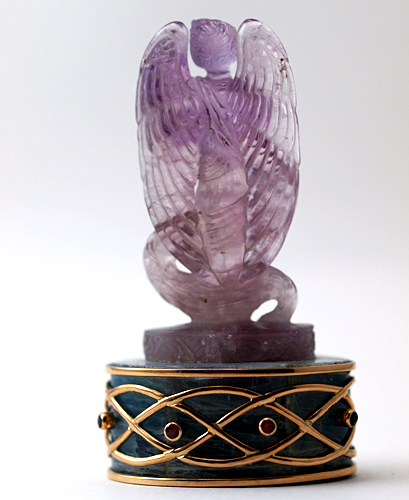 This Angelic gemstone altar has been cleaned with Universal Life Force Energy, and given an energy attunement using Reiki, a Japanese technique of energy healing, so it will continue to receive and transmit Universal Life Force Energy direct from the Source of Creation. It has also cleaned and charged with the natural energy of sunlight. It is ready for you to program according to your own needs and desires. Weight above is shipping weight. Net weight is 51 grams or 1.8 ounces.